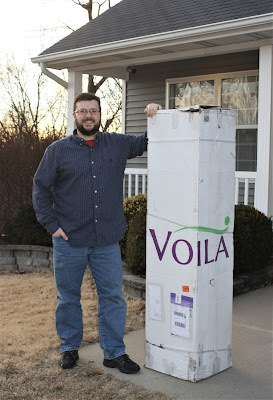 I was fortunate to be able to recently review a Voila Mattress. Voila calls itself "The first showroom-quality hybrid performance mattress in a box." Will it live up to that description? Let's find out! read on for full details . . . If you head on over to Voila's website, the first thing you might notice is layers! As in, the Voila has lots of them . . . 12 to be exact. The layout of these layers can vary a little based on the firmness level that you choose: plush, medium or firm. According to the company, the plush comes in at 3.5 on the firmness scale (where 10 is the most firm), the medium comes in at 6, and the firm comes in at 8.5. I personally reviewed the medium, and would say it rates at about 7 to 7.5 on the firmness scale (I'd imagine that the "firm" is very firm!). It definitely comes in a box! Regardless of firmness level, all Voila's have many things in common. They start with a thin, breathable cover with mesh sides. This allows for good air-flow, which is a feature you'll like if you sleep hot. We were never once hot! Next will be some combination of quality memory foam and Talalay latex (Talalay is also arguably the most breathable latex around). These provide great pressure relief and comfort. Each Voila also has what they call the "triple layer edge support." This is an additional, very sturdy foam that runs all the way around the edges (thicker on the sides than the ends). The idea is to support you when sitting on the edge, and it does this well. In fact, I was told by a Voila representative that they had to design a special machine to compress it and get it in the box -- needing more compression that most bed-in-a-box mattresses! I can imagine it does take a lot of compression, with all those layers! Note that because of this, the coils do not run all the way to the edge of the bed. You will be perfectly well supported sitting on the edge, but it won't have as much of that "bouncy" feel if you sit on the edge. 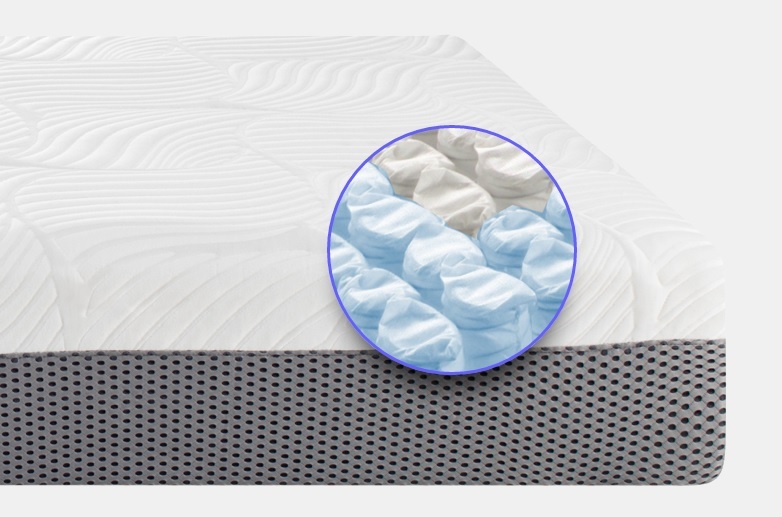 Finishing it off, of course, the bottom of the mattress has individually wrapped pocketed coils in a zoned structure so that the heaviest parts (such as hips) get the most support. 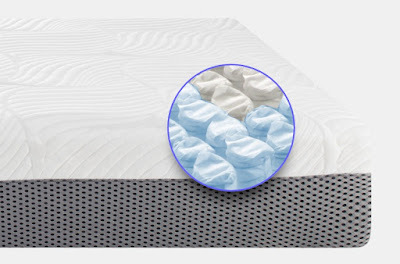 This is the main thing that differentiates a hybrid from an all-foam mattress, and provides some bounce, but not as much as you would find in an all-coil mattress. There aren't a whole lot of internet-only hybrid mattresses out there (I only know of about 4 or 5, not counting the budget mattresses on Amazon that really are in a different category.) Of this group of 4 or 5, Voila is the least expensive that I know of, as of the date of publishing (after using coupon code "dugroz10" to get a 10% discount). My wife and I slept on it for over 2 weeks (almost 3 weeks -- I don't recall exactly how many days, but more than 14)! Here's how it stacks up. The Voila mattress is very heavy! (130 lbs for a queen) That’s a good thing in some senses – good in that it won’t move around on the bed, though a little difficult to move room-to-room once out of the box (my wife and I got it up the stairs after it was unboxed!). It also means that the construction didn’t go cheap. Simple yet nice cover that is very flexible. The cover does have seams but they are well stitched. The overall construction is very complex and robust with the 12 separate layers. There was no off-gassing or chemical smell, but the "new mattress smell" did last about 2-3 days after the unboxing. The feel is quite nice. Laying on the top layer is pleasant and you feel like the mattress is taking good care of you. It has kind of a “flat” feel but that’s not a bad thing. What I mean is that the "hug" is fairly minimal. If you prefer to "sink in," look elsewhere. I should mention that I tried the medium, but I would guess even the plush isn't something where you totally cave into the mattress. Note with the Voila you should be using a thin, flexible mattress protector. If you use a quilted protector, you are actually taking away from one of the best aspects of what this type of mattress brings to the table. There is some motion transfer across the surface of the mattress, but not all that much. I change positions frequently, and my wife, Debbi, said I didn't bother her during our time on the Voila. Voila has the support that I would expect from a hybrid mattress. My spine feels well aligned, and the firmness is even. There is the “5-zone” layering of the construction, but this is done in a way that doesn’t detract from anything. It’s got the right balance of sink & support. The only reason I didn’t give 5 stars here is because it doesn’t have quite as much responsive “push-backness” (my own, made up word) as it would need to in order to get the perfect score. I think if the top layer had been latex (the latex layer is the 3rd one down) this would have been better. Don’t get me wrong, it’s really good in the support department, just not perfect. Of course, this is an area where different people will feel things differently. Check out the Voila's zoned coils and mesh sides. I need my hips and shoulders to sink in some, but not too much. Voila does well here. It’s also a bonus that you can balance this with support by making your own choice of soft, medium, or firm (I reviewed the medium). This is a big deal for us because I weigh quite a lot more than Debbi. Voila did fairly well here. I would say the area that the noticeable “sink down” extended away from my body was about 6-8 inches. This was minor enough that it didn’t bother her. There was no unwanted rolling, she didn't roll into me during the night, and the “hug” of the mattress had a good balance between sinking in a bit, but not being enveloped. This is something of a preference item as well that will vary from person to person. I was able to both email and speak with a very nice representative of the company. I didn't see any horror stories online about the return process, they all seemed fairly smooth. It’s also worth noting that while the specific Voila brand is fairly new, the underlying company has been in the business of manufacturing mattresses for 25+ years. They actually have most of their experience in the world of medical mattresses. I only point that out because it adds comfort that it’s a company that should be around a long time. I don't give a star-rating to shipping, but shipping is free (you can pay extra if you choose to have expedited shipping or delivery on a weekend or holiday). It is delivered by UPS or FedEx, it only took 2 full days to arrive in my case, and I just did the standard shipping! (I ordered on a Monday, and it arrived late afternoon on Wednesday). It comes in a box, compressed. There is no cost to you if you decide to return it during the trial period. The Voila has a 10 year warranty. The warranty kicks in with ¾ of an inch or more of sinkage or indentations. This is very good (most warranties only kick in with 1.5 inches or more – a few of the more forward-thinking companies have it at 1 inch, but to start the warranty at ¾ of an inch is great!). There is no proprietary foundation, you can place it on any solid surface, a sturdy foundation, or a bed that comes with slats like a platform bed. We have ours on the Zinus Quicksnap Platform bed -- which I reviewed separately here. - Rather difficult to move the mattress around (for example, when rotating or moving to a new room) as it is quite heavy. This is likely the case with most hybrid mattresses. - The mattress is not entirely made in the USA. The Voila Mattress strikes a nice balance between top-end quality and price. You can find cheaper mattresses (such as Amazon budget mattresses), but they won't be as nice or last as long. You can find slightly nicer mattresses, but they will be more expensive! Plus, with the 100 night in-home trial, you're not out anything but time if you decide you don't like it. 100 days is more than enough to make that determination. If for some reason you don't feel like Voila can be your every-night mattress (and it certainly can! ), it would make a killer guest-room mattress. After we tried it out for over 2 weeks, my father-in-law came to our home for a visit and slept on it for 4 nights. He really liked it and said it majorly increases the desirability of making our house a pit-stop in the future. It's also highly likely to hit a "sweet spot" that appeals to all different kinds of people, so would be great for a guest room, rental cabin, etc. that has many different folks coming through (assuming the medium firmness). The Voila has a feel that is truly part memory foam, part innerspring. I guess that's what hybrid is all about! I can definitely recommend it. If you decide to try out the Voila, use coupon code "dugroz10" at checkout and you will get a 10% discount! In fact, not only will you benefit by getting a discount, it also helps out my blog and YouTube channel just a bit! The first number below is the "raw price" and the number in brackets is the net price after the 10% discount -- coupon code "dugroz10"
I was provided with a Voila mattress in exchange for my review. If you use my coupon code when buying a Voila, I earn a small referral fee which helps to support this blog and my YouTube channel. In addition, other links on this blog are considered to be "affiliate links" (such as the links to products through Amazon) and I am paid a small referral fee if you click one of these links and subsequently make a purchase. This costs you nothing. All opinions are my personal reviews and preferences, and do not represent the opinion of any particular company. Thanks for your consideration.